When did you first get into weaving and tapestry? I first got into weaving when my mother bought me a toy loom as a child! It sparked an early fascination with weaving which lead me to experiment with woven sculpture at art school, and from there to tapestry weaving. What excites you about the medium and process of working with wool? Its hard to choose just one thing because there are so many elements of the process of weaving that I love. Working textiles is very tactile and intuitive but also analytical- I spend a lot of time on calculations and working out proportions and sizes. There’s a strong conceptual element for me also- I’m fascinated by the incremental nature of building up a solid surface line by line. Which art movement or artist/s have had the most influence on your practise as an artist? 20th Century Minimalism and modern architecture are probably my two big sources of inspiration. The work of artists such Agnes Martin, Eva Hesse, Richard Serra and Donald Judd have been important influences, and the architecture of Tadao Ando and Shigeru Ban has continued to inspire me over the years. The textile sculptures of Magdalena Abakanowicz and Ernesto Neto are also huge influences. What is your process when designing a tapestry, do you design it before you start or is it intuitive as you go along? I begin with a very rough sketch, where I block out the proportions, and then I go from there. Certain elements or shapes will be cut out life size from paper, and I’ll draw around these onto the loom to make sure I’m getting the shape I want. But mostly it’s a very intuitive process, and it takes me a long time at the early stages to be certain about the colour combinations. I’ve been known to change my mind about the direction of a piece completely half way through. If you could have a studio visit with any artist in the world (past or present) who would it be? Agnes Martin, because I’ve always loved how evocatively she spoke about her minimalist work. If you could own one artwork what would it be? Could I be cheeky and ask for a house? It would be Shigeru Ban’s “Curtain Wall House” in Tokyo. Do you have any favourite Museums / galleries in the UK or over seas? Tate Britain is my favourite in London, it’s always so serene. The Rachel Whiteread show in 2017 where they removed all the dividing walls and showed her work all one space was one of my favourite exhibitions ever. I also love the Barbican both as an exhibition space and for the architecture. What is your daily studio routine? I start my day with yoga and coffee. Then I walk to my studio in Dalston, and usually get into the studio between 8am and 9am. The first hour or two in the studio is usually spent organising and preparing for the day, taking care of urgent admin and clearing space so I can spend the rest of the day weaving. I’ll aim to weave for at least 5 hours on an average day, but sometimes longer when I have a big deadline. At the moment my time is split between developing new work, and working on commissions. I usually try to wrap up my day around 6pm, although in busy periods I’ll stay at the studio until 9 or 10 at night. The long hours are necessary as weaving is a very slow process! But while it can be physically demanding, it’s incredibly therapeutic. I always miss it when I’m away from the loom for too long. I love how your work is a contemporary approach to traditional portraiture – what interests you about working in this style? 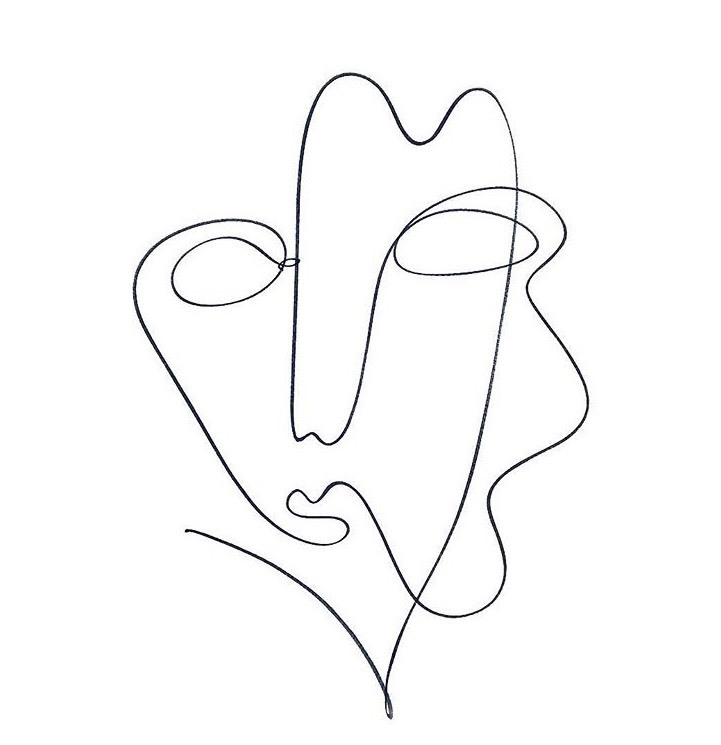 I love the immediacy of it, and how a single line can express so much of the personality of a face or fullness of a body. I was always very cautious when drawing or painting portraits, and experimenting with single-line drawing gave me so much freedom to make mistakes and go down a more abstract route without worrying if the pieces were perfectly lifelike. They sort of take on a life of their own! Which art movement has had the most influence on your practise as an artist? I’ve been obsessed with the Vienna Secessionists since I can remember, especially Egon Schiele. His nudes are so contorted and disturbing, but they’re just mesmerising. Going to Vienna is pretty overwhelming when you love those artists, it’s very emotional to see their work in the flesh! What is your process when making the single line drawings, do you sketch them first or just put pen to paper? I used to dive straight in and not plan anything. That gave me some of my favourite pieces, but the amount of lovely paper I was getting through started to really bother me. I now sketch a few drafts before I start on a piece, but allow myself to make any spontaneous changes if it feels right. If you could have a studio visit with any painter in the world (past or present) who would it be? Frida Kahlo, Picasso or Jean Arp. Just to sit in a corner and watch them at work! And Barbara Hepworth would be a pretty incredible person to be in the room with. Her sculptures radiate so much energy, I’m sure she was amazing to be around. Do you tend do draw from life or imagination? I draw from imagination a lot, but the pieces I create from life are always better somehow. I force friends to come and life model for me as often as possible, and I use strangers’ faces as constant inspiration. I often base collections on places I’ve travelled – I think you’re more attuned to other people when you’re somewhere else in the world. I just did a little series on the fisherman in Finland, and finished a project based on the amazing women on the beaches in Sicily. If you could own one drawing what would it be? Any of Picasso’s one-line animals. They’re so soothing to look at. Or one of Tracey Emin’s nudes. I love everything about her! The Kunsthistorisches Museum in Vienna has the most overwhelming collection of art. It’s such an opulent building with rows and rows of oil paintings and marble staircases and this beautiful domed ceiling. I spent 6 hours in there once and only realised because my back started aching…! And Foam in Amsterdam always has fantastic photography exhibitions. It never fails you. Which art movement has had the most influence on your practise as a painter? In a broad sense I suppose it would have to be Modernism, which incorporates so much, but elements of Post-Impressionism have been a great influence. For me it’s more about certain painters from different eras. Titian, El Greco, Munch, Magritte, Per Kirkeby and Rene Daniels have all been great influences. As well as Delacroix and Lupertz. And Picasso! There are so many. What’s your favourite subject to paint? Subject for me is just stuff that happens around me, things that are already in existence and I just happen to notice it - it could be a simple stool in a café that just has something about it. There is a hat stand in Mayfair that I have to photograph every time I walk past it. It has these awful woolly hats of characters – like knock-off Muppets or Angry Birds – that just looks so odd a few doors down from Nobu, but it has something about it; an innocence. Maybe my subject is a focus on the overlooked in plain sight. What is your process when making new work, do you start with preliminary sketches? Not really. I tend to just launch in to painting. I might make notebook drawings when I’m not in the studio but wanting to be there, but generally they are drawings after the fact – trying to organise what I’ve already started painting. I paint over old, failed paintings all the time, so don’t need to plan anything in order to keep a pristine surface. Painting is an activity and I like to be active. Novelists often give tips that boil down to ‘just get on and write’, and I’m the same, just get on and paint. If you could have a studio visit with any painter in the world (past or present) who would it be? The brief list in the first answer would be a good start. How important does the role of colour play in your work? Colour is really important but also not that important at all. I have a habit of reaching for a few key colours but then the painting kind of takes over. And because I use oil pastel as well as oil paint – often when the paint is still wet – I tend to get quite muddy with colour. I am not a technical painter by any means, but there has to be something that is visually arresting, though I don’t really care what that colour is. I often get jealous of other painters’ use of colour – some can make it look so effortless – but I just get on with it and try and make it work. Ouch. Tough question. Just one?! Titian’s Flaying of the Marsyas would be up on the list. But then Leon Kossoff’s great Children’s Swimming Pool, Autumn Afternoon from 1971 may have to be it. I saw it on a school visit and it was the first painting I saw in the flesh that made me want to paint. I already enjoyed drawing and painting but this was different. It had everything and I couldn’t believe it was possible, but there it was. Can I have one of his swimming pool charcoal drawings too? Louisiana Museum of Modern Art on the shore of the Øresund Sound in Humlebæk, north of Copenhagen is hard to beat. And Tate Britain, as it’s where I saw the Kossoff, and I used to work there, so have had great time alone out of hours with a lot of the collection. I cycle there as early as possible, switch on the radio and boil the kettle and start painting on whatever is currently on the walls – about four or five things at a time. It usually takes about an hour before I have to re-boil the kettle to make that first cup of tea, as I just tend to get on with painting. What’s your favourite subject to photograph? 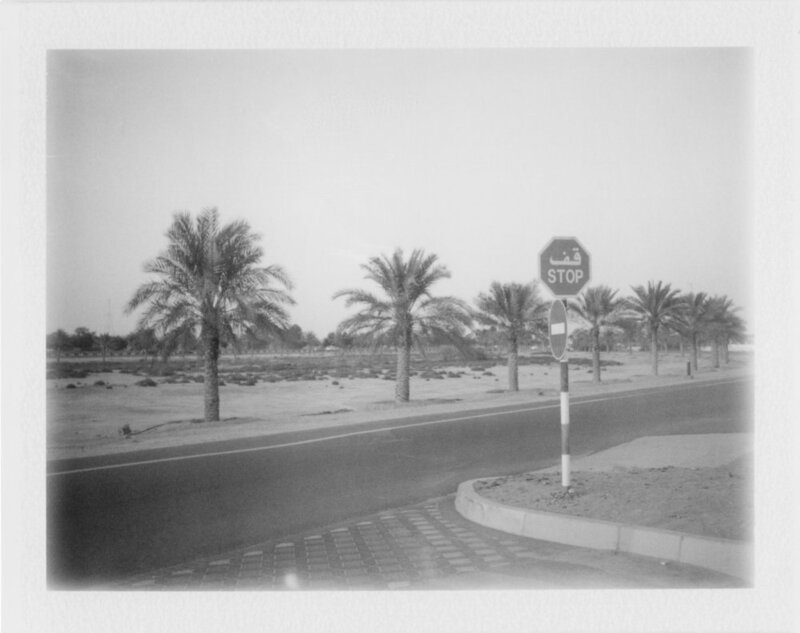 I know you primarily work with the medium of polaroid – what do you enjoy about this process? There are several reasons why polaroid feels really special to me. The physical nature of the print, especially at a time when we mostly always view photos on screens; the way the image emerges as if by magic; the fact that each polaroid is a one-off; and the intimacy of its small scale. What inspires you when you are out with your camera? The process itself. The type of film I use – what is commonly called “peel apart” or “pack film” – was first developed in the 1960s and sadly isn’t made anymore. It has become really difficult to find and its scarcity forces me to slow down and consider each shot carefully. Working in this way provides an escape from the unrelenting fast-pace of life today. What was the first camera you purchased? When I was 20 my father gave me a 1970s Nikon – a beautiful object that inspired me to pursue photography seriously. A few months later I bought my first polaroid camera; it was just a basic model, but for the reasons I describe above, I was hooked from the first time I clicked the shutter. If you could photograph any place in the world where would it be? Iran. I’m 100% Iranian, but sadly have never been there. The country has vast and varied natural beauty – mountains, waterfalls, forests, deserts. I’d love to see it at first-hand. Is there a particular movement of photography that has had the most influence on your work? I’m more drawn to individual photographers. I find the intimate quality of Sally Mann’s photographs incredibly beautiful; I love the rawness of Peter Beard’s work; and the quiet sophistication of Sugimoto’s seascapes. If you could own one photograph what would it be? It would have to be one by Sally Mann. Perhaps Candy Cigarette, 1989. I love going to museums and have too many! Apart from the major ones, I’m a big fan of The Photographers’ Gallery in London, which always has high-quality exhibitions. The Pitt Rivers in Oxford is strange and fascinating. In Paris, Jeu de Paume has fantastic photography shows, and the Musée du quai Branly for the tribal art. The Frick Collection and the Neue Gallery in New York. And of couse the Peggy Guggenheim Collection in Venice. It's always changing! New things are always catching my eye, but I suppose a recurring theme in my drawings is people going about their everyday lives. We have so much access to filtered lives, which look perfect on social media, so to see real people doing normal things I find satisfying. Do you always draw from life or do you take pictures for reference? It's a mixture. I love drawing from life, in order to keep the drawings loose and as free as possible. Having a split second to draw a character I saw on the bus can be really refreshing - to not over think or plan. It’s interesting to see what ends up on the page but I try to draw from memory otherwise. I do take a lot of photos on my phone. Sometimes I will draw from memory, and then after doing all the memory drawings I will re visit the photo. It can be surprising what our memory forgets and remembers. You recently collaborated with Gucci, (congratulations by the way!) what did that entail? I was working on a people-watching project in Florence (where I grew up). I was lucky enough that Alessandro Michele was shown my project, and then asked to collaborate. The series of drawings were turned into a capsule collection, launched in the Gucci Garden in Florence. Which artist’s do you look to for inspiration? Again it’s always changing. But I love the work of Sanya Kantarovsky. He used to be an illustrator. I love the bold colour and the narrative in his work. Especially the paintings he did based on the book Master and Margarita. Chantal Joffe, I love her colourful loose figurative paintings. Very simple and bold. But I also love looking at the classics like Botticelli! Most of your illustrations are small in scale, do you prefer the intimacy of this size? I don't really know why I love working so small. Sometimes I go the complete opposite and do massive drawings, just to change it up and experiment. I think it started because I was moving around so much in London, from one apartment to the next. My artwork became a bit of burden, so I started to make my work more manageable. It felt like I had more control over where all my drawings were! Do you have a daily studio routine or are you out and about with a sketchbook? I do have a studio routine, although I try to get out and about as much as possible. It is important to get out and see where the action is. As much as I would love to be a hermit in my studio, it is vital for the drawings to go out and see places, exhibitions and people! If you could own one work of art what would it be? I would happily look at one of Soutine's Chef portraits every morning. I am obsessed with the Wallace Collection... I would visit it every day if I could. The colour’s, the character’s, the decor... the decadence. I love everything about it! Pentax K1000 35mm film camera when I was 13. I know your work is primarily associated with portraits, what do you look for when photographing people? If I’m going to be choosing the subject, then an atmosphere, or energy. Something that intrigues and attracts me. If you could photograph any one in the world who would it be? The list is endless, but right now the German actor, Nina Hoss. This list is also endless! Right now I’m inspired by Harry Gruyaert, Raymond Depardon (especially his ‘Cities’ monograph), Luigi Ghirri, Edward Weston, Florence Henri, Imogen Cunningham and Lore Krüger. Picasso with his pet Goat, Esmerelda by Edward Quinn, 1956. Many! I love all the Tate galleries of course and the V&A. Kettle’s Yard in Cambridge. Also Mucem in Marseille (a museum focused on the Mediterranean). What is the Collograph process used for making the monoprints? I use a paper block which can be layered with fabrics or paper to create texture or mood. The figures in this series were cut out from very thin card and layered on. After the ink is rolled on it was also worked on with brushes, before being rolled though the press. I printed these on recycled paper to give an added warmth and depth to them. I know you primarily work in the medium of Textile which has been labelled women’s work for centuries, what do you like about working with a needle and thread? I love the irony of it, something which was traditionally taught to keep women's minds busy and pure being used to open conversation on contemporary women's issues. It somehow feels so right. There is also something about the slow and laborious nature of the work. It takes commitment, its meditative, and, especially when embarking on really large scale works, the task ahead can feel overwhelming. In all these ways the sewing process echoes the act of dealing with personal trauma, which is an important theme in my work. Which artists have had the most influence on your practise? I am influenced by any female artists who have created brave fearless art: Artemisia Gentileschi, Frida Khalo, Lousie Bourgeois, Barbara Hepworth, Jenny Saville and even contemporary illustrators like Gemma Correll. Most recently I was inspired all the artists who lent their skills to support the REPEAL project in the Republic of Ireland. Using art to support social and political change is a huge part of what I do. What’s your daily studio routine? A hearty breakfast, choose some films to watch or music to listen to and get stuck straight in! 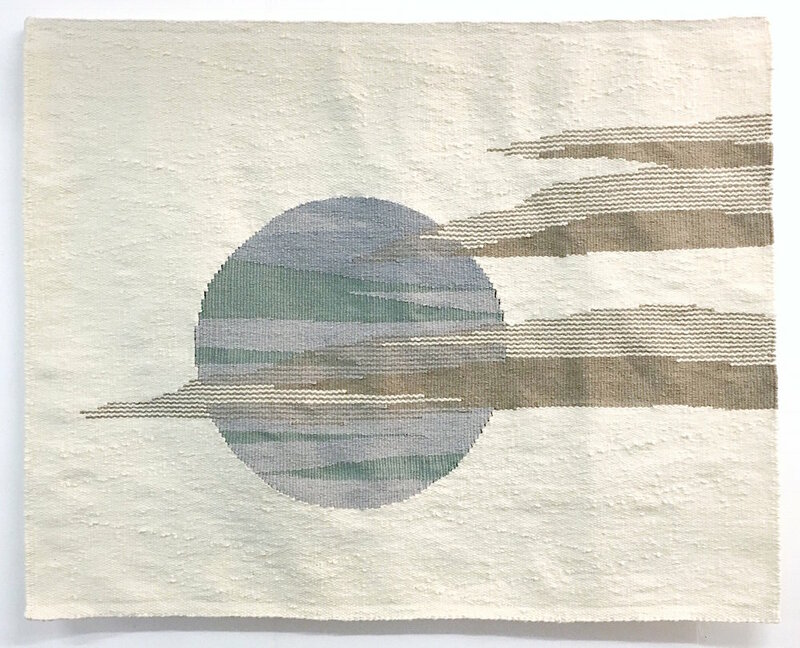 I've been working on a large scale textile piece for a few months. A piece on this scale will take around 600 hours to complete. If I need a break from it I will sketch new concepts, or just sort through my piles of fabrics and threads, sometimes they tell me what they are going to be. The GX Gallery in Camberwell where I have all my work framed always has such an interesting eclectic mix of established and upcoming artisits, I love my trips there. Visiting the studio of Olivier Suire Verley on Ile de re last year was magical.